The Abarth badge, all Scorpions, proletarian pomp and red stripes, is sixty this year. Having found new life in the tuned version of Fiat’s Giugiaro-penned Grande Punto and the coolest little kid on the block the 500, we thought it about time we pay homage to a sub-brand of Italian motoring that has set heart rates quickening for decades. In a way it’s appropriate that a car brand associated with almost cartoonish latin qualities was started by Carlo Abarth, an Austrian who didn’t move to Italy permanently until he was thirty (when he changed his name from the German sounding Karl). 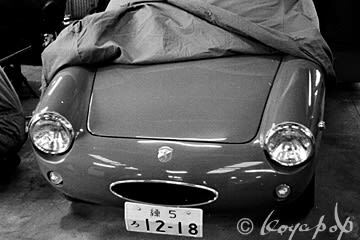 Launched in April 1949 in Bologna through the fifties and sixties Carlo’s company concentrated on producing small-run or special edition sports cars in collaboration with other companies, often using existing production models as platforms to build the Abarth legend. Notable highlights in the early era include the Monomile and the 2200 Spider. It wasn’t until 1971, when Italian state-owned behemoth Fiat bought the brand, that the badge became associated with truly tuned Italian niceness. As a Fiat owned sub brand, the Scorpion produced a cult classic racer in the 131 Abarth Rallye. This transformed version of the supremely workaday 131 (pictured) was highly successful in world Rallying with legends like Walter Rohl at the wheel (who won the world title in 1980 to complete a hat trick of championship wins). With this highpoint at the start of the decade of power shoulders, the Scorpion badge began to drop gradually down Fiat’s agenda and out of our consciousness. Until 2007, that is, when Fiat relaunched the sub brand with a very high profile, high budget push into the market with the aforementioned Abarth Grande Punto. And the Abarth 500? It is blistering. Ironically, the Abarth relaunch has been oddly overshadowed by the phenomenal success of the 500. The little classic has transformed Fiat’s erstwhile tainted image without the help of the Scorpion’s rakish sting. "When Abarth released their tweaked version of the hugely successful Fiat 500 prodigy we were banging their doors down to have a crack at the little whip. It was actually the 'Essesse' version that we ended up ragging round the hills "